The Hank Aaron State Trail provides a 14-mile continuous connection from the lakefront, west to 94th Place, and eventually will connect to the Milwaukee/Waukesha county line. Along the route there are a variety of environments ranging from urban, to river views, to prairie and wooded surroundings. The Trail can take you to many of Milwaukee's top destinations! Thanks to environmental restoration efforts along the Trail, you can enjoy the simple pleasures of nature and access the Menomonee River. Connections to the surrounding neighborhoods are an important element of the Hank Aaron State Trail. 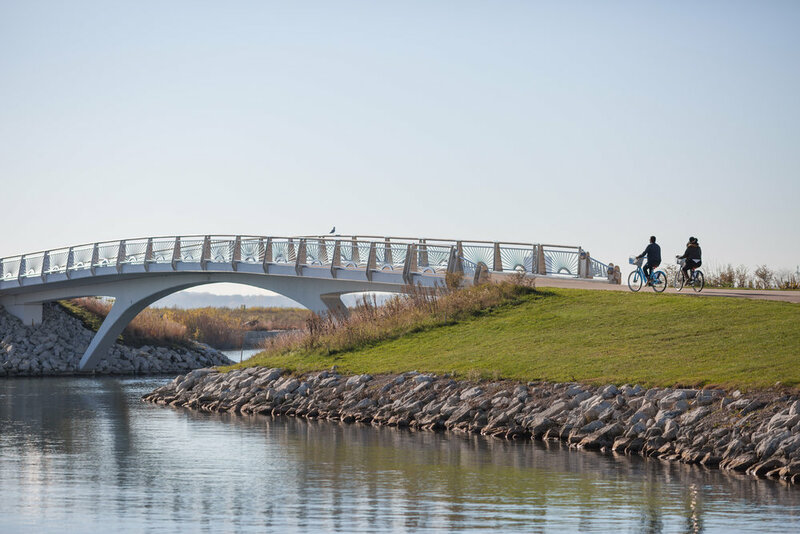 The entry points and bridges provide access to the Trail for commuting to work and recreational opportunities for the 100,000 youth and 315,000 adults who live within three miles of the Trail. While the Trail travels through Lakeshore State Park, the Historic Third Ward, and the Menomonee Valley, it's accessible to many others which offer opportunities to try new restaurants and get off the beaten path. Lakeshore State Park lies along the shoreline of Lake Michigan adjacent to the Henry Maier Festival Grounds, providing a unique urban oasis with a multitude of recreational opportunities and amenities. Opened in 2007, the 22-acre park offers overnight boat docks, a lakeside multi-use trail and improved fishing access. The 8-acres of short-grass prairie provide a unique natural background to spectacular views of the city skyline and Lake Michigan, as well as a home to fox, mink, deer and many bird species. Future plans include a park visitor center with public restrooms and showers for overnight boaters. Educational programs at the park explore a variety of lake and river-related issues, including fishing clinics, lake ecology and the cultural history of the area. Education partnerships have been established with major area colleges, community centers, Discovery World, Milwaukee Public Schools and many lake-focused organizations. Education offerings include park programs, off-site lectures, or hands-on experience at the park. The Hank Aaron State Trail accesses Lakeshore State Park from both the north and the south, making a loop around the park and the Third Ward, before heading west across the river and into the Menomonee River Valley. The park provides a wonderful trailhead for the Hank Aaron State Trail and also connects to the Milwaukee County Oak Leaf Trail. Learn more about Lakeshore State Park. Visit the Friends of Lakeshore State Park to learn about the park history, amenities, upcoming events, and volunteer opportunities. The Menomonee River Valley was historically a wild rice marsh. The river and adjacent lands were used extensively by Native Americans for travel, fishing, hunting, and agriculture. By the late 1800s, the marsh was filled and industry occupied much of the area. In fact, there are several manufacturing firms still active in the Valley, some of which were founded over 130 years ago. The Chicago, Milwaukee, St. Paul, and Pacific Railroad, located to the east of what is now Miller Park, at one time employed 5,000 people, many living and walking to work from the surrounding neighborhoods. Over 50,000 worked in the Valley by 1920. Interstate highway development of the 1950s, and the economic recession and accelerated deindustrialization of the 1970s and 1980s led to dramatic shifts in the Valley. Most businesses closed or left – until fewer than 7,000 people worked in the Valley. The storage of sand, salt, coal, and junked vehicles contributed to the environmental degradation of the area. Since the 1990s, efforts to revitalize the area into a sustainable and productive commercial and recreation district began to gain traction, led by brownfield clean-up and development, location of several businesses to the area, the formation of Menomonee Valley Partners, and efforts by neighborhood groups and local, state, and federal governments, including expansion of Canal Street and the development of the Hank Aaron State Trail. Today, the efforts of so many are evident in the rebirth of the Menomonee River Valley. For more information on the Valley, visit Menomonee Valley Partners. Inhabiting the niche between the Milwaukee River and Lake Michigan is the Historic Third Ward, Milwaukee's oldest center of commerce and warehousing. The area's architectural splendor is evident in the many original brick buildings that were built in the wake of the Great Third Ward Fire of 1892. The last few decades has seen a rebirth of the Third Ward as the neighborhood has evolved into one of the city's most vibrant areas. The Third Ward is home to the Milwaukee Public Market, Broadway Theatre Center, and Milwaukee Institute of Art and Design, art galleries, restaurants, shops, and more. The Historic Third Ward also includes the Henry W. Maier Festival Park, home of Summerfest and several of Milwaukee's wonderful ethnic festivals, as well as the Italian Community Center. The extension of the RiverWalk from downtown provides a excellent opportunity to explore the city. With the influx of thousands of new residents, the Third Ward has an energy all its own with bicycle and pedestrian-friendly streets and sidewalks. The Hank Aaron State Trail travels through the heart of the Third Ward, with trailheads at either end of Henry W. Maier Festival Park, connecting with the Milwaukee County Oak Leaf Trail to the north, and Lakeshore State Park to the south. The southern portion of the marked Trail follows the Milwaukee River along E. Erie Street until crossing the bridge at Young Street, where it joins with the northern branch of the Trail coming from Chicago and Milwaukee Streets. The wide sidewalks and pedestrian-friendly streets make venturing off the marked Trail easy, with access to all that the Third Ward has to offer. Learn more about Milwaukee's Third Ward - its history, arts, theater, dining, tours and other events.